Sorry, so long since my last post. Today my post is about one of my favourites desserts, Cream caramel or “Pudim de leite condensado” as is known in Brazil. I always make Cream Caramel when I need a quick dessert. This recipe is how we make it in Brazil. Make the sugar caramel first. Place the sugar and water in a pan over medium heat, stir until the sugar dissolves. Boil, uncovered, without stirring, until mixture turns light golden brown. Pour in a coffee cake pan (the one with a hole in the middle), spread on the sides and leave to cool. For the cream caramel: Pre heat the oven 180°C. Blend all the ingredients together and pour over the caramel sauce. Put on the oven covered with aluminium foil in a tray with hot water reaching half of the cream caramel pan (Ban Marie). Leave on the oven for 45 minutes or until a skewer comes out clean. Leave to cool down before turn it on a plate. 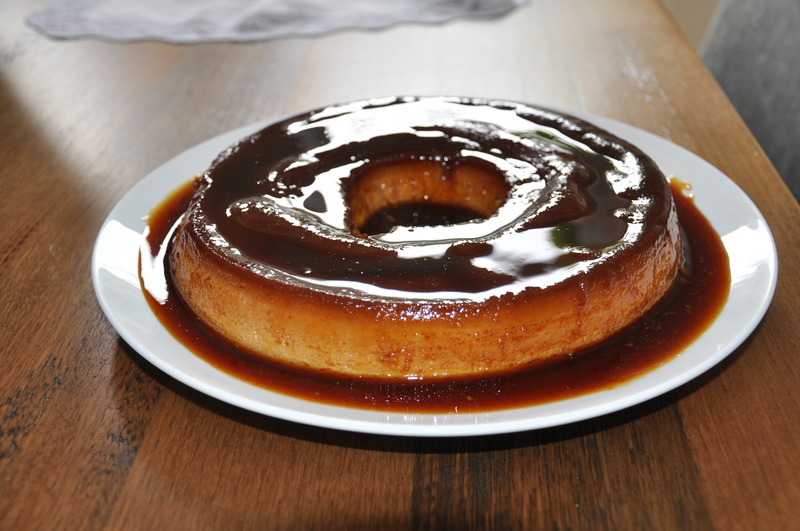 This entry was posted in Recipes and tagged caramel sauce, condensed milk, Cream caramel by clarissaskitchen. Bookmark the permalink.